South Korea's Song Young-han held off world number one Jordan Spieth to win his maiden title at the Singapore Open. The duo were among 13 players who had to finish their final rounds on Monday after Sunday's play at Sentosa Golf Club was curtailed by thunderstorms. American Spieth sank a five-foot birdie putt on the last hole for a five-under-par 66 to finish 11 under. Song, resuming on 12 under, parred his remaining three holes for a one-under 70 and victory by one shot. The world number 204 began the day with a testing 12-foot putt at the 16th, but a simple tap-in at the last secured his first professional victory after two second-place finishes on the Japan Tour. 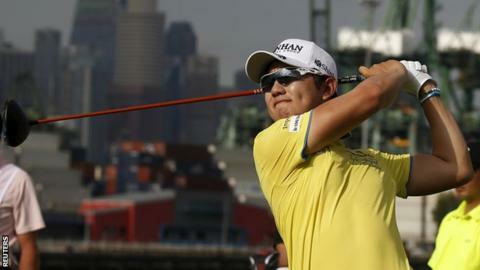 Song, 24, led from the second round and was five in front of Spieth heading into the final round.